The spooky season is just around the corner. If you’re a true fanatic of the All Hallows’ Eve who’s always hosting Halloween dinners, attending ghost tours, watching horror movies, and wearing scary costumes to celebrate the season, you might be decorating your home with spooky elements as early as now. Name it – pumpkins, skulls, bats, witches, ravens, and faux cobwebs. 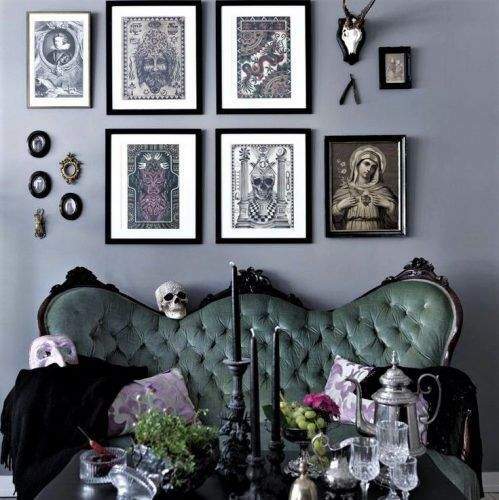 But if you think about it, Halloween decors can also be glamorous – just think about decorating with eerie, outdated, yet elegant gothic candelabras and chandeliers, gilded skulls, and a variety of antiques, which add character into your home. Want to add a ghostly yet chic vibe into your home? 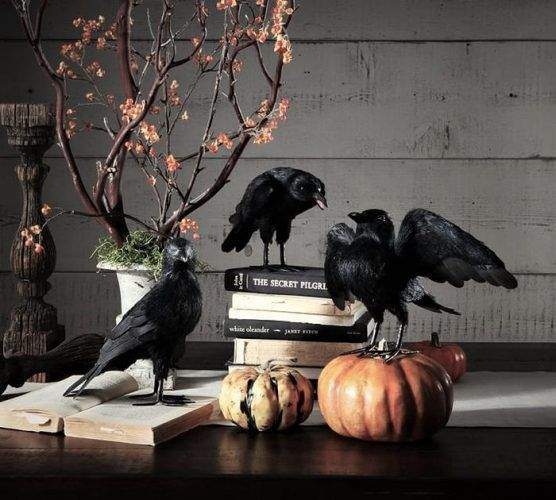 Here are13 stylish Halloween decors you can display all year long. 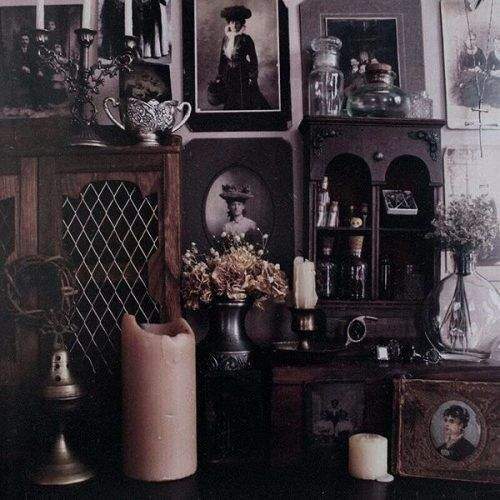 Conjure up a spookier atmosphere by limiting your light sources and displaying antique light fixtures. A gothic chandelier never fails to give you that eerie Victorian era vibes. If you’re broke, vintage candelabras work too. Pair the spooky candle holder with long black candles that provide a vintage vibe, or some red candles that melt like blood. Fancy and lustrous takes on pumpkins and skulls are anything but creepy. 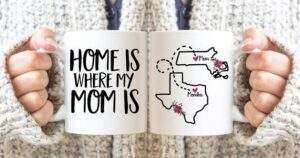 Rather, they give a touch of glam into your home. 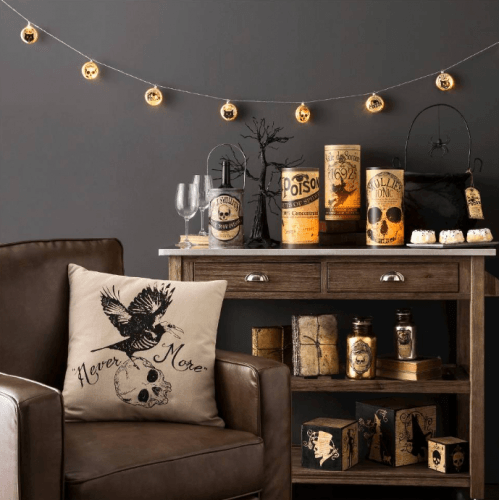 Think about displaying stylish pieces like skull vases, gold-plated skulls, chopped hand candle holders, and a variety of pumpkin centerpieces in matte or glossy finishes of black, silver, and gold. 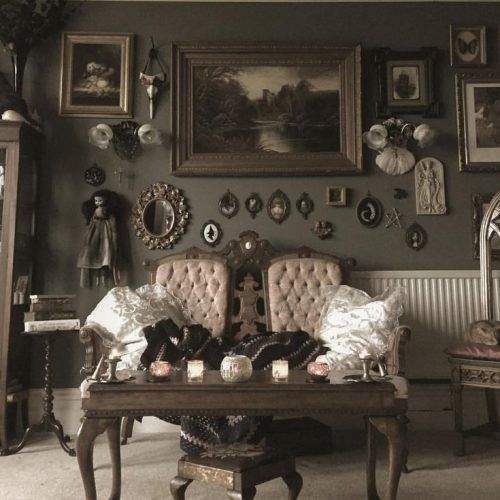 Old objects, like clocks, storage chest, statuettes, classic paintings, and old picture frames with fading photographs of ancestors (who are obviously dead) don’t just add extra spook – they also add extra texture and mysterious mood to your home. Make your dining set elegantly eerie with posh gothic tableware and cutlery. Black, whether it’s glossy or matte, is quite a creative take on your flatware, plates, glasses, and wine goblets. Look forintricate details too, like dinnerware with skull and damask patterns, skull mugs and morbid mug handles, bone cutlery, and lace table runners. Vintage bird cages make great decors both for indoors and outdoors. Give them a spooky twist by painting the metal cages black and putting freaky ravens inside. Fake ravens, of course. Place fake ravens in random parts of your home, both caged and free. Faux ones look eerie, but if you’re a weird bird lady, you might want to care for a real black bird. If you’re looking for an elegant yethair-raising décor,find one realistic-looking, fauxhuman skull and put it inside the glass dome. Let your guests wonder if it’s real or not. Can’t find a life-sized skull? 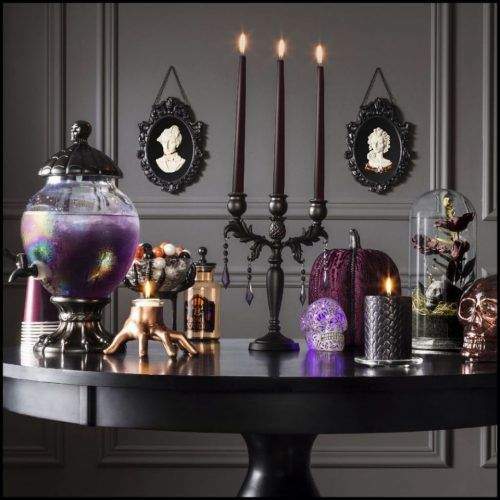 Mini skulls on glass domes, fish bowls, and glass jars look spooky yet elegant too. If vintage porcelain dolls like Annabelle with white skin and dead eyes aren’t creepy enough for you, I don’t know what is. Make these dolls a part of your home décor. Dress them up with elegant classic lace dresses pulled out from the 1800s. Just don’t stare at them during midnight – they might blink. Antique figurines made from porcelain or ceramic often give you the creeps, whether they are as godly as angels, saints, and religious statues or as disturbing as clowns and witches. Display a few of them on your home, along with your antique candelabras. We’re not talking about the gory masks for an easy Halloween costume – we’re referring to stylish masks you’d wear in an elegant masquerade ball, carnival, or on Dia de Muertos. 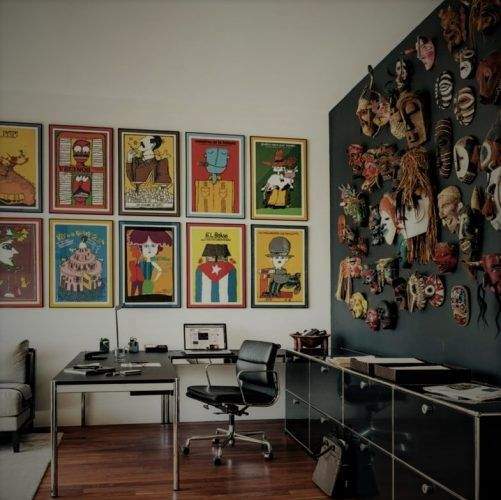 Display decorative masks of different shapes, sizes, and styles. They make great wall décor, especially if they’re embellished with elaborate details like colorful feathers, glitters, beads, metallic paint, and other frills. You can also mix wooden masks, like African tribal masks. Give people with green thumbs some nightmares by displaying haunted houseplants as centerpieces. 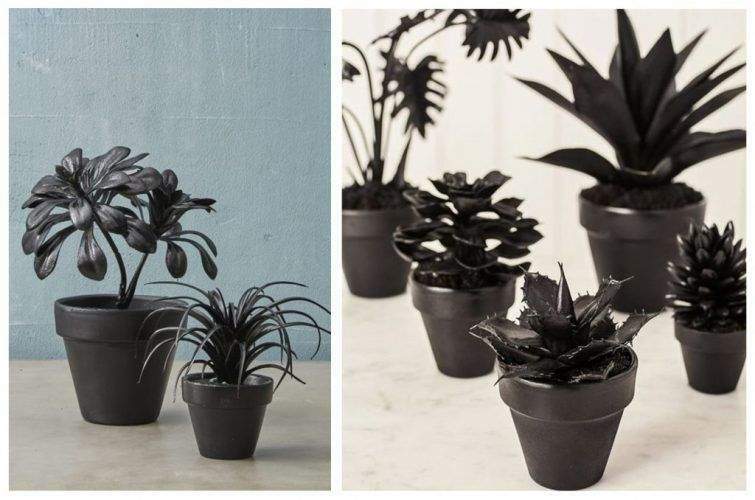 Of course, you don’t have to kill real pants to achieve the effect – paint fake houseplants black with spray paint and allow them to dry (and look dead). Would you drink something that says, “drink me” written in sketchy Old English calligraphy, and is contained in a vial? I don’t think so. If you have wine and other liquor, or even colorful juices, be extra playful by putting them inside suspicious vials and bottles. They’re not only fun at house parties – they also make great decorations. 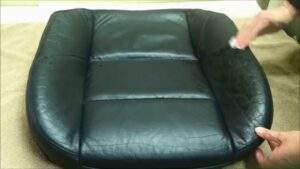 One cheap and easy way to change the mood and style of your home is by changing your throw pillow cases. Look for horrifying but artistic graphic designs, like skulls, witches, smiling pumpkins, and clowns – something no one would actually attempt to hug. Author Bio: Mina Natividad is a resident writer for Wincrest Home Builders, one of NSW’s most experienced and well-renowned home builders aiming at building and designing modern family homes in Sydney, Newcastle, the Central Coast, and the Hunter. 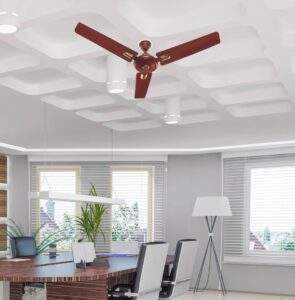 She loves writing articles focused in real estate and interior design.